This is a guide concerning ripping VC-1 encoded 1080p/1080i Blu-ray movie to H.264 MKV with Pavtube ByteCopy software, which is a Blu-ray decypter and VC-1 to H.264 encoder. By Blu-ray movie I mean movie on a commercial Blu-ray Disc or saved in Blu-ray structure, i.e. Blu-ray ISO image file created from a copy-protected disc. If you’re seeking for a tool for converting VC-1 encoded 1080p/1080i MKV to H.264 AVI/MP4/MPEG, or converting VC-1 1080p/1080i M2TS to MKV/AVI/WMV/MP4, Pavtube Blu-ray Video Converter Ultimate is recommended. For ripping 1080p/1080i Blu-ray VC-1 stream to H.264 MKV, you may download a restricted trial of Pavtube ByteCopy and follow the guide below for encoding VC-1 M2TS to H.264 MKV. To directly rip 1080p/1080i movie from Blu-ray Disc, you need to hook up an external Blu-ray Disc drive with your PC and place a Blu-ray Disc (VC-1, MPEG-2 TS, MPEG-4 AVC encoded) into the BD drive. Step 1. Load movie for 1080p/1080i VC-1 to H.264 MKV conversion. Run Pavtube ByteCopy, and click the “Load BD/DVD” icon to import movie files from Blu-ray Disc. To load BDMV folder, choose “Load BD/DVD folder” from the dropdown list of “Load BD/DVD”. To rip 1080p/1080i VC-1 movie from Blu-ray ISO image, mount the ISO with virtual drive first and then choose “Load DVD ISO/IFO”. Step 2. Choose output title and audio track. The main title (the fist one) contains main movie and is checked by default. Expand main title, and uncheck the audio and subtitles you don’t want to keep. You may check other desired Blu-ray titles in file list. Step 3. Convert VC-1 1080p/1080i to H.264 MKV video. 1. Select/highlight the whole movie (root directory). 3. Find “Format” box, and select “custom” from drop-down list. 5. 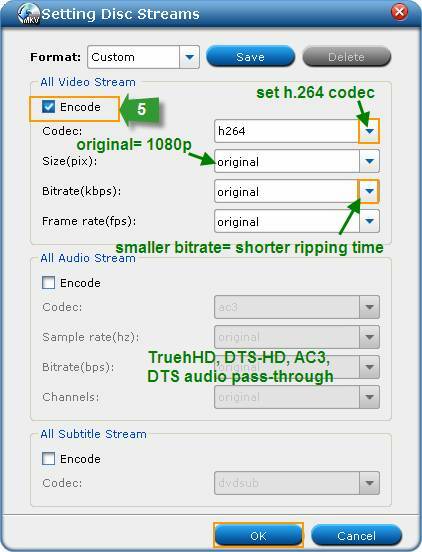 Check the “Encode” box under “All audio streams”, set codec to H.264. Save settings and back to main interface. To rip VC-1 encoded Blu-ray movie to H.264 MKV with 1080p HD quality, just set “original” or “1920*1080” in “Size” box. Step 4. Converting 1080p/1080i VC-1 to H.264 MKV. When back to the main interface, click “Convert” button to start ripping VC-1 1080p/1080i to H.264 MKV format. After conversion you can click “Open” to find converted MKV file(s). When transcoding 1080p/1080i VC-1 to MKV with Pavtube ByteCopy using the above settings, Blu-ray video streams are converted from VC-1 to H.264, while original Blu-ray HD audio streams (Dolby TrueHD, DTS-HD, Dolby Digital, DTS, PCM, LPCM) are retained. So you have desired titles/chapters, audios, subtitles and desired video codec in an MKV file. Note: the trial of Pavtube ByteCopy puts a Pavtube logo on the screen, and you need to purchase a license to get rid of the watermark logo when converting ripping VC-1 to 1080p MKV.